I was reading a paper which claims a negative correlation between welfare state spending and imprisonment rates ie the less spent on the welfare state as a % of gdp the higher the imprisonment rate. They plotted NZ as having 144 per 10,000 people in prison in 1998 with welfare spending at 21% of gdp. In defiance of their theory both have increased in the past ten years. Personally I don't think one can draw concrete conclusions about the relationship by comparing countries because there are just too many variables at play. But while I was looking at imprisonment rates for NZ I came across this rather sobering fact. On any given day of the year 3.2 percent of male Maori 23 year-olds are in prison. Now a study has revealed that individuals receiving welfare commit crimes anyway, usually after they have quickly exhausted the assistance received. This is one of those 'if you didn't laugh' stories. The authors recommend that welfare payments get issued weekly instead of monthly "which will smooth patterns in crimes." New Zealanders are delaying having children, as increasing living costs, debt and work demands begin to take their toll on family life, a study says. A Families Commission report, made public today, says people are delaying having children as increasing numbers of working families struggle to make ends meet. The report charts the change in families and conditions since the end of World War II, and shows the standard of family life has dropped dramatically since the post-war baby boom. In 1970, before the DPB, most families were self-supporting. Let's say 97% with the other 3% relying on a sickness, invalid or widow's benefit. Today only 80 percent of families with dependent children are 'self-supporting'(and many of those are net recipients receiving WFF assistance). Simple maths tells us that all will be worse off as a result. If seven families are trying to earn enough productive income to support themselves and three others it stands to reason. "If families thrive and both produce and nurture future generations, then the workforce, the economy and the social fabric of New Zealand will also thrive." But many families are not thriving and nurturing which is exactly why the social fabric is looking somewhat worn and tattered. Welcome to the twenty first century. This is what a socialist 'caring and sharing' society looks like. And before you start feeling optimistic that maybe at last a government agency is 'on to it' look at their recommendations. "If we want to maintain the population and help people to successfully balance their work and family life, then it's important to look at policies that would support parents to have children or to have more children." Paid parental leave should be extended and workplaces made more "family friendly". More redistribution and more central planning. I don't know how long or how much hardship New Zealanders are going to have to endure before the lesson is learnt. Government is not the cure. It is the problem. 'Church on Sunday' thinking contributes to crime? In my experience the church-goers are not committing crime - except when they reject the church and go back to drug and alcohol abuse. In my experience the church-goers are not fond of welfare. I related some time back the story of the church-goers who came and worked on our property throughout what remained of their Sunday in order to raise money for a rehab unit in their community. They weren't holding their hands out to government and they weren't sitting on their bums. In fact the party I would most strongly associate with South Auckland "churchies" is one of the few parties prepared to look dispassionately at welfare. The Family Party is extremely concerned at a prevailing attitude amongst young girls who view the Domestic Purposes Benefit as a valid career choice; not understanding the detrimental affects such a lifestyle has on their children. If Not PC wants his next suggestion to ever gain traction he might find more support from South Auckland churchgoers than most other groups. Stop paying no-hopers to breed. We are forced by government to pay people to have children they don't want. The result of all those unwanted children appears on the front page of our newspapers nearly every day. I am an atheist but I am also tolerant of people with religious faith. It is their business and to presume their faith somehow turns them into potentially dangerous, psychologically-malleable dependants is somewhat far-fetched. Talking to Mark Sainsbury on Breakfast TV this morning John Key resisted arming police. "Then we will turn into New York" he said. And what would be particularly wrong with that. New York City is a success story when it comes to crime trends. Which is the preferable trend? NYC or Counties Manukau? Now I've just read in the NZ Herald : Counties Manukau police, who are investigating the three homicides, say they don't believe crime is escalating. They don't believe their own statistics. What hope. Justice delayed is justice denied ...or is it? Can't argue with that....unless you are the Minister for Courts Rick Barker who begs to disagree. "Part of justice not being denied is that due process is done appropriately and not rushed." The time before a court case reaches a resolution was not a delay, but merely part of the justice process, Mr Barker said. That is his excuse for most jury trials taking over a year to be heard in court. To reduce the overload on courts ACT's policy is to operate night courts, a practice employed in the US, Canada and Singapore. I don't imagine jury trials could operate outside normal working hours but other court business could be sped up thereby freeing up resource to reduce jury trial waiting times. Let's have some practical solutions to this problem instead of excuses. 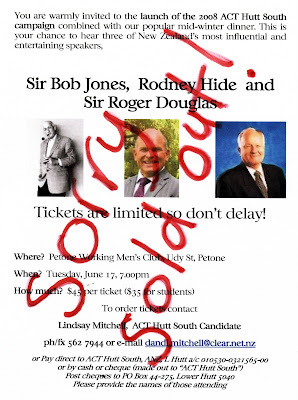 Return of Sir Roger "Adds spice to election"
Surprising as it seemed when first canvassed, the re-entry of Sir Roger Douglas into national politics has assumed serious proportions with his announcement that he will contest Hunua for the ACT party. "He's on fire," proclaimed party leader Rodney Hide. "I've struggled to keep up with him." Mr Hide's enthusiasm is understandable given Sir Roger's track record, so much so that those who may initially have written off Sir Roger as a political has-been are having second thoughts. Those under-estimating Roger Douglas do so at their peril for there is much truth in the adage that: "No one in politics should ever be under-estimated -- until and unless there is evidence to the contrary." For Sir Roger, no such evidence exists or ever did for that matter. More than 20 years after his heyday in the finance portfolio he remains one of the most dominant political forces of the past generation, revered by some and poison to others, but never one to be ignored. His legacy has been policies which have stood the test of time and never been overturned: floating the New Zealand dollar, introducing GST, halving the top tax rate, establishing state-owned enterprises to be run on business lines and making the Reserve Bank independent to control inflation. Those who have read his book "Unfinished Business" will appreciate he has not run out of ideas, and the challenge for other parties is to judge the electorate's receptivity towards them. With Sir Roger in the forefront, ACT has several things going for it in the lead-up to the election, one being space at the Right end of the political spectrum which John Key has seemingly overlooked in his wooing of middle New Zealand. Another is the sheer radicalism of ACT's policies, including a 20-point pledge card with a plan to out-perform Australia by 2020 and a matching macho slogan: "The guts to do what's right". Third is Sir Roger's undiminished drive, conviction and personal magnetism. Another is the prospect of luring former supporters back into the ACT fold. It adds spice to the election! About the In Work payment that the Child Poverty Action Group is challenging in court, Tapu Misa writes, "There's little evidence that such incentives work. It's true the number of people on the unemployed benefit or DPB has fallen since 2000, thanks largely to a strong economy, but the proportion of children in severe and significant hardship increased 36 per cent between 2000 and 2004. As the OECD has noted, employment isn't the full solution." Taspu Misa is possibly unaware that two OECD representatives are appearing for the government. This paper compared the effectiveness of a 'benefit' strategy and a 'work' strategy in achieving reduction in child poverty. It concluded that a work strategy would be more effective in New Zealand. Hence I believe it is the authors of this paper that the government are going to use to defend their current strategy. It is benefit dependence that creates child poverty. When benefits are increased, more people opt for them over work. Isn't it strange that when carbon emissions are widely accepted as contributing to global warming (rightly or wrongly) there is a clamour from the political left to reduce them yet the same logic is not applied to benefits. Ironically Tapu Misa's chosen analogous headline, "Kids are not gambling chips" probably provoked a more direct response in many. Exactly. They are not meal tickets for feckless parents looking to increase their incomes to squander on, amongst other things, gambling.